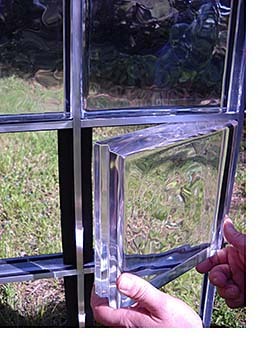 2100GL Snap-In Gridlock Glass Block system's 2-inch thick solid glass blocks snap securely into place without the use of sealants or adhesives. Broken pieces are easily removed and a new block is simply snapped into place in the lightweight, prefabricated aluminum frame with no exposed fasteners. Block options include etched or back screened.